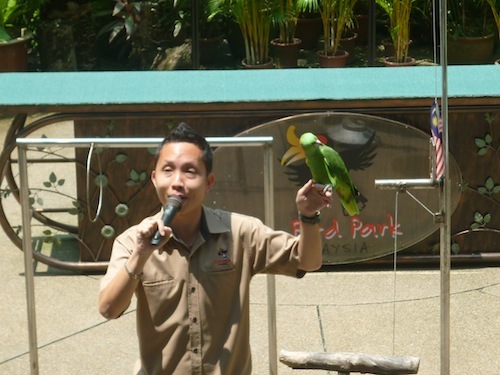 We took the opportunity of the public holiday last Wednesday to visit KL Bird Park. Coming along were Teoh’s family and Tony’s family. I also invited my brother Eric to join us. Altogether there were six adults, four children, and one baby. 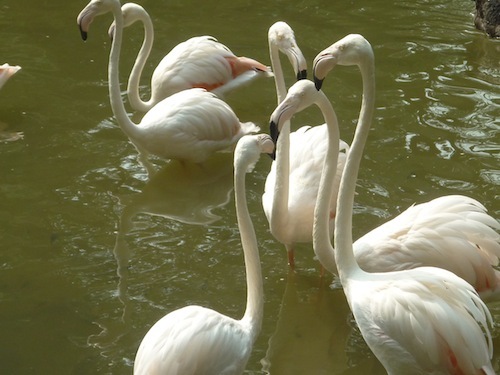 The last time we went to KL Bird Park was some 2-3 years ago and we find the bird sanctuary is well maintained and it’s worth to make future visits. That’s why we made this second visit. Over there you can see many species of birds. Not all are in the cages because some are interactive such as feeding the birds and free walking peacocks. The children enjoyed the trip very much. They get to know the birds up close and not to mention the time together with other little friends. We spent about 5 hours in the bird park. 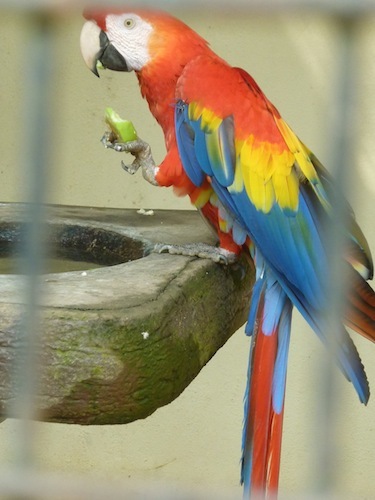 The recommended way to tour the bird park is: Once you enter KL Bird Park, take a left turn and go along the path right till the end – which is where Amphitheater is located. Then make a turn coming back to the right side of the Park. Along the way you can see many birds: from hornbills and flamingoes to parrots and love birds. And there is a place for you to feed lorries at the World of Parrots. Be careful as some of the birds are “aggressive” when they try to get the food. Children should be under adult’s supervision when feeding the birds. A small container of feed costs RM1.00. One thing you must not miss is the bird show. It is performed twice a day at 12.30 pm and 3.30 pm respectively. The show lasts about 25 minutes. The venue for the show is Amphitheater. Go there early (15-20 minutes) to grab the best seats as the seats are filled up quite fast. 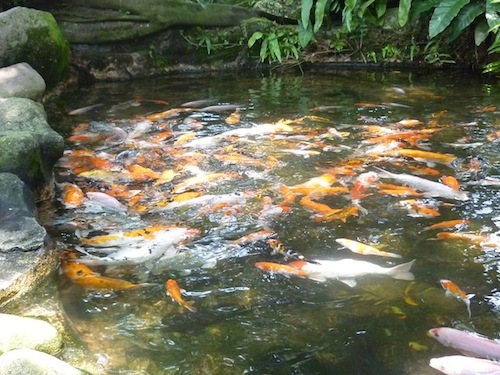 There are 3 places you can feed the fish – mainly koi. Don’t worry if you don’t have the feed because you can get it from strategically placed vending machines. Each packet costs RM1. The machines only accept 50 sen coins. Another interesting place for children to explore is Nursery. This is where children learn about incubators and hatching. 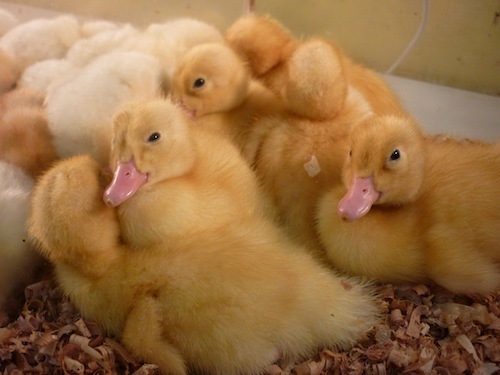 Again, to get really up close, they have the chance to hold and stroke the chicks and ducklings. A real life experience for kids about farm animals. The best time to visit the park is 9 in the morning when the park is just open. One is to avoid the crowds which arrive later. And the second reason is the morning weather is cooler compared to the later part of the day. Besides well placed and a good amount of washrooms, I notice there are many patios scattered around the park in which visitors can have a short break. It is very convenient if you have small children and babies. Since they tend to get tired easily, these patios make it a perfect place to stop and rest before continuing your tour in the park. We stopped at a patio near Amphitheater for a quick snack (thanks to CC for the awesome sandwiches). Also there’s a refreshment kiosk (near the entrance and exit) in the park where you can reward your child at the end of the trip with ice-cream. That’s what we did. For children, there’s a playground opposite Amphitheater. If you want to bring home some souvenirs, there is a gift shop there that you won’t miss – as you will definitely go through it where you exit. Another facility that I like is Hornbill Restaurant. We dined there in our last visit but we didn’t go there this time. The ambiance is welcoming and the food is good. 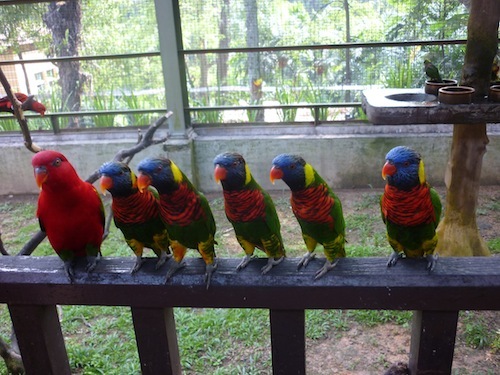 By normal standard, KL Bird Park is above average. The park is very well-maintained and I don’t say this lightly. The washrooms are clean and functional. I am not easily impressed but I am very pleased with the overall cleanliness of this popular Kuala Lumpur tourist spot. Besides that of course there’s a huge collection of birds in the park. Tip: Grab a copy of KL Bird Park brochure near the ticket booth and check out the Daily Activities first before your tour so that you won’t miss anything interesting there. Malaysians: RM20 adults, RM10 children (3-12 years old). Since we had some sandwiches in KL Bird Park, we had a late lunch. After our visit to KL Bird Park, we took a very short drive to Central Market. 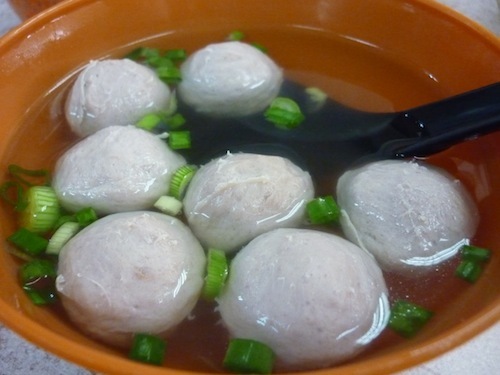 We parked our cars there and walked to Restoran Soong Kee for a nice bowl of the famous and delicious beef ball noodles. I don’t know when was the last time I had this. It must be very long as my kids had not come along yet. It’s always nice to get to taste excellent food after a long period. I especially like the springy noodles and mined beef as the topping. The kids love it too. I should have ordered a big bowl because in the end I ordered two small bowls of noodles (I know I am greedy). Though the big bowls cost one dollar extra but it is well worth it as the serving is almost double the small ones. 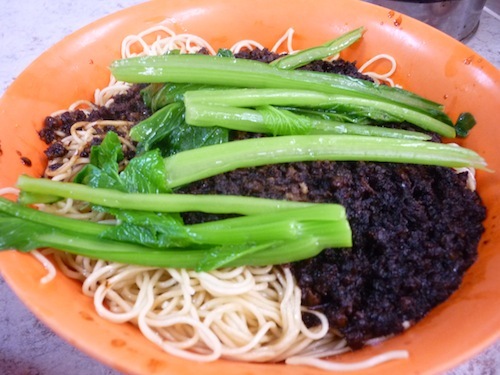 I prefer the dried version of Soong Kee beef noodles. Every bowl comes with 7 beef balls served in soup. Prices: RM5 small, RM6 big. After our lunch at Soong Kee, we took a stroll at the famous and historical Central Market. Over there, one can find Malaysian souvenirs, arts and crafts, paintings, and you can even try your hand at batik painting at a highly affordable price. On the first floor, you can try out Malaysian delights at the restaurants there. Personally, I don’t find the food there authentic enough. Again, it was a long time ago since my last visit here. 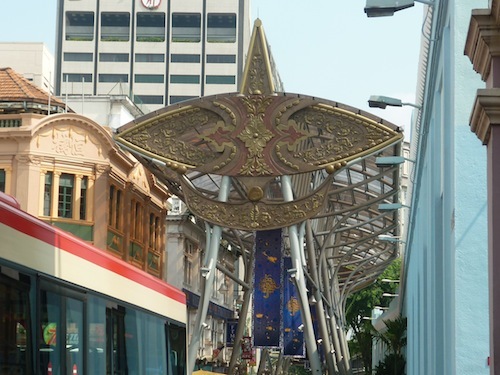 The main purpose for me is to check out its majestic Kasturi Walk – a covered walkway right next to Central Market with wau (a Malay kite) design.